Charles Wyche Jr. “Charlie” born to his parents Charles Wyche Sr. and Olympia Valle on August 23, 1923 in Los Angeles. Charlie spent his childhood with his brother Jack at the McKinley home for boys located in Van Nuys. Graduated from Van Nuys high school in 1942, where he was named All Valley League for basketball. 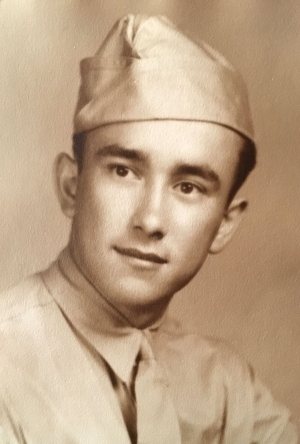 He joined the Army Air Core in 1943 and became a radio operator. 1946 was an air crew member flying over the coast of Africa. After the service, he spent one year teaching in Africa and then taught military dependents in Zaragoza, Spain where he met his late wife Maria Redondo “Lola.” After their five children were born, they returned to the United States in 1965, to Fillmore, where Charlie taught at the Fillmore junior and high school and coached tennis and basketball as well. Charlie was happiest on the tennis courts (one of the best players in Ventura County) and while traveling with Lola all over the world. Charlie is preceded in death by his brother Jack and his daughter Ana. He is survived by his wife Maria and his four children. Au contraire daddy, you did not have a dull life.